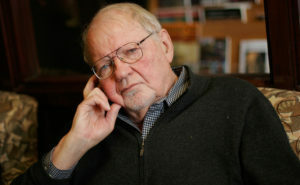 One of the most important voices on the left, Fredric Jameson, in this interview provides us with some reflections on contemporary political theory, its directions and misconceptions, possible solutions for left-wing politics and its present limitations, the importance of the Occupy movement, Bernie Sanders, and possible conceptual and ideological solutions at a time when the new fascism is, according to him – not yet here. FB: What should be the focus of political philosophy today? Jameson: The tradition since 1968 has been to put an emphasis on power. In terms of power, there has been a shift from what we call a “class politics” to what we call an “identity politics”. This caused the weakening of the labor unions, even though labor union politics is not necessarily a class politics. So today, I think we should return to an emphasis on economics without necessarily having a preconception about what those economic solutions should be. It seems to me that the most important issue is of that of unemployment and this is why I think there has to be a politics of full employment. For instance, self – management may be an option for reconstructing industrial infrastructure on the basis of smaller industrial units. Talks about the minimum wage on the global scale is not a bad way of stimulating people’s thought about the way in which we may deal with capital which moves elsewhere due to wage differences. In the US case, there is great resentment about these companies that moved out and don’t pay taxes anymore. The insistence on power thanks to the prestige of Foucault, among others, is not where new politics should develop. FB: What is then the biggest obstacle to such a theoretical and political “counter – shift”? The big problem is globalization that stands for a new financial logic which is running everything. This is not even American hegemony, but rather a hegemony of new this global class. Europe is a good example of a political form that is arranged so that it might not be answerable to any of the national publics. They do things so that no single national constituency has control over them and that’s a symbol of the whole problem of world politics today. There is a class which has managed to find the formula to avoid any kind of democratic voice, even though many of these countries still take the external form of representative democracies. FB: What kind of institutional set-up and / or internationalism can we talk about in order to challenge this global financialization? Jameson: The old national politics was easier. You could have a left wing government passing measures such as minimum wage or union protection. Today this is not possible. When the problem was just Europe, or just France or The United States, then somebody would think of some ideas. Now, the whole world is present and involved. I think there is a whole new set of political concepts that are demanded by the situation of globalization – even socialist concepts are demanded by that. We haven’t been able to think about a new political reality except in terms of The United Nations or alike. Maybe some kind of the new federalism may be a solution. The old models collapsed. Take Yugoslavia as an example which shows how a federation can be affected by the decision of the International Monetary Fund to deal directly with the republics and not with the central government, which encouraged the dissolution of the Yugoslav federation. This is the problem of federations – rich federal units do not want to be taxed in favor of the poor ones – and this is what is happening in Europe today. FB: What are the obstacles to this “new internationalism”, both theoretically and practically? Jameson: There seems to be little interest among the various Lefts today in practical political alliances across national borders. One of the great attempts to achieve this cooperation was the World Social Forum. The problem was nevertheless that the far left, for which I have a lot of sympathy, was still locked in their national borders. There is a reaction of people all around the world, from Brazil to France and Eastern Europe and a lot of political energy has been absorbed by struggling against national reactionary movements which are very powerful – look at France for instance, or even Germany. The inflow of refugees makes the situation even more difficult. For the moment, the left has withdrawn to fight these local fights and the real internationalists are still the bankers and the people with money and they are the ones who cooperate with each other. Similar things happen with the intellectuals. They do not have that much feeling about what is happening in other countries. French intellectuals are for instance so preoccupied by France and they are not paying too much attention to what is happening in Germany or Ireland. Americans know nothing about the outside world. There is still a great deal of provincialism all over the world, the left being even more provincial than the right. FB: Who should open up the space for “de-provincializing” the left? Jameson: I think one should focus on media, the question who controls them and what is their structure. Media certainly isn’t propitious to new thoughts by the intellectuals. Since the 1960’s there were all kinds of utopian ideas about the media, none of which have worked out. Some people expected a new democracy. It happened, but none of that meant anything. What should be looked at is how business controls media. Trump for instance, was created by the media which were reporting on every single speech he delivered. From this perspective, what we need is a demagogue who speaks to the demos and explains things. This shouldn’t be a dictatorship of course. 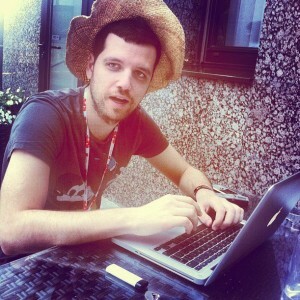 FB: What about the so called “new media”? Do they have the potential to counter-balance main-stream media? Jameson: The mass protests of the Arab spring, Turkey, United States are something that was pushed forward by the new media, which have become a new political form. My colleagues and friends Toni Negri and Michael Hardt have tried to theorize it by using the concept of multitude – but this is definitely not the most stable source of political power. The whole point is that certain movements can destroy entire political structures, but then a void is created. Tahrir square protests destroyed the dictatorship, but suddenly there wasn’t anything else but the Muslim brotherhood that took over. In Iraq, the US together with the Brits destroyed the communist party and the only substitute for the left was religion. The slogan of democracy is not something I am very comfortable with, mainly due to American foreign policy and this is why I don’t think it is the best slogan for the left. FB: What is the alternative? Stuart Hall had an excellent concept for political struggle and he called it discursive struggle. He meant something similar to Laclau’s idea – if you discredit the slogans of the enemy than you accomplish something – you make it impossible for them to use their slogans. This is what Mrs. Thatcher did so brilliantly. The one case of a masterstroke on the Left in this discursive struggle was the Occupy movement. If Occupy had done nothing else but that, it would’ve been a really decisive blow in American politics since it reorganized all the entire language, previous discussions and identity politics itself. FB: Talking about Occupy, the following question comes to my mind: Would Sanders have been able to push his progressive discourse forward had there not been for the emergence of this discursive change by the Occupy movement ? Jameson: Definitely not! It’s funny, since he is from New York; but Vermont is a kind of a “third world country” and only in Vermont somebody like him could have been elected to office. These are the backwards parts of the United States. In Germany, it would probably be East Germany that could produce this kind of ideas. Through political pedagogy Sanders has been successfully pushing the discourse towards economy and progressive politics. 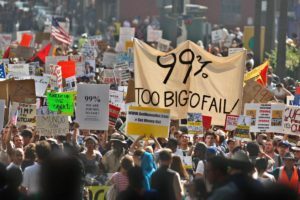 Occupy Wall Street, which never had a single program, was very important because it came back to the issue of class. That’s why Sanders has been so important, because he revived the whole language of economics that was missing from a lot of the discourse on identity politics. FB: At the same time, nevertheless, Trump has happened. Jameson: To go back to what we have already discussed. There is a moment when institutions are destroyed. On the republican side, there is no policy: they don’t want new taxes, they don’t want to spend money and they just want to keep it. On the democratic side, they’ve been able to prevent Obama to do anything. Hilary did not have any ideas either. So a kind of vacuum is created and this is where this Trump figure comes from. The similar phenomena occurred in Italy with Berlusconi. The republicans had absolutely nobody for these elections. People are now saying – this is a new fascism and my answer would be – not yet. If Trump comes to power, that would be a different thing. FB: You mentioned Laclau. The work of Chantal Mouffe and Laclau himself has been influential in some leftist circles. Should the left look for solutions to contemporary challenges in this kind of distancing from the “traditional left”? Jameson: Their work is really a brilliant exposition of practice of politics and the practice of slogan making. However, they staged it as an attack on class and Marxism and I think that was a great mistake. Like a lot of European political philosophers – Toni Negri for instance, they had this experience of the old communist party that was standing in their way and a lot of their arguments were going against the structure of an old communist party. But for people who didn’t go through this at all, to argue against Marxism and against class is to undercut the very nature of political reality. Ernesto himself misunderstood the political value of his own ideas. He thought of them as post-Marxist and I think that was a great mistake. Laclau’s point was that the empty signifier didn’t always have to be economic and of course – anything can suddenly become a cause. But in the long run, economics is everything. Laclau certainly played an important role, as an intellectual, in restructuring the practice of politics, but it would be a mistake not to mention the relationship between economics, industry, banks and unemployment, for instance. FB: Do you think the left should (also) focus on restructuring the concept of the state? Jameson: Yes, restructuring it, but not in the way of the discredited social democracy. Restructuring the state should be something more than social democratic management of capitalism. We still need a state because the minute when we start feeling the real consequences of the ecological crisis, there must be a powerful state out there. It’s better to think what the socialist state should look like than to leave the state to the fascists. FB: For some future thinking, how should we avoid the same mistake of the 20th century regarding a strong socialist state? Jameson: There is no guarantee to that. However, the specific pre-capitalist moment of modernization in which Stalinism occurred is gone. On the other hand, I don’t think the existing state of affairs is capable to keep going like this unless it uses military power. That’s what Trump has talked about. “America first” – that was the slogan of the right wingers of the 1930’s, the fascists in this country. That’s a real tendency both here and in Europe. It’s a matter of ideological choice now. FB: Don’t you think that the left has already missed the chance with the 2008 crisis? Hayek and Friedman had been working since the 1950’s on the new project that finally filled the vacuum created in by the crisis of the 1970’s. There was no such set of ideas and policy solutions “on hold” on the left in 2008. Jameson. You’re right, there was nothing prepared. The left was exhausted from its previous experiments – Stalinism, defeats like those of Allende, the disappearance of the Soviet Union itself and the defection of the various social democratic parties by the momentary (“discursive”) triumph of free-market rhetoric… Few years ago I would be talking about Venezuela or Brazil – I guess I can’t do this anymore. There were some movements on the left. FB: But do you think movements are enough? Do you still believe in party politics on the left? Jameson: I think there has to be a certain kind of party politics. But the problem is that the left parties need to get the money from somewhere in order to finance healthcare, education, full employment, environmental policies. The right wing parties are the ones which are lowering the taxes and after someone lowers taxes, it’s very difficult to raise them again. This is the weakness of the left today. 16 Responses to Fredric Jameson: People are saying “this is a new fascism” and my answer is – not yet! Wonderful interview with fine questions from you.Thank you so much. “Mrs. Teacher”….should be Mrs. Thatcher, I suppose. Thank you for those clarifications. There are likely other errors and omissions as well; this interview was written from the recollections of the author about an informal conversation between the two and was published without full editing review of Fredric Jameson. And Trump DID come to power a few days after this interview, something Mr. Jameson must not have thought really possible. So there is your fascism. The world is a very different place now, but we can still fight. This interview actually occurred during the summer of 2016.